I could leave home at least 15 minutes later. It gave me a longer ride all of 4km more. The only drawbacks were the hill up into Dudley, and having to negotiate the Dudley bypass and Burnt Tree islands. The ride to the station was uneventful, though a few spots of rain were falling as I arrived, and I was rather early having allowed too much time, especially as there was a following wind. The train journey was equally uneventful, and we made excellent time to Coventry, though as a result of slow running around Rugby we were nearly 10 minutes late by the time we got to Milton Keynes. Nevertheless, there was plenty of time to spare, and in the end the start of the ride was slightly delayed while those who had arrived by motor vehicle found a suitable place to park! There were 10 riders, but all the local contingent were on conventional large wheeled , non-folding machines, and it was left to Graham McDermott (Moulton 'Pylon' Speed), Peter Evans (New Series Moulton), Chris Dent (Bike Friday Airglide), Peter King (SP Brompton) and myself (Brompton T5) to represent the folders and separables. We rode gently on paths, tracks and quiet roads out to our lunch stop, troubled only by a light drizzle during the latter stages. 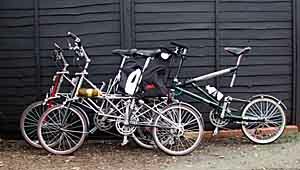 The elite, the Moulton New Series, Speed and Bike Friday Airglide, stayed together during the lunch stop. The Brompton at Stony Stratford, pictured in splendid isolation as it was the only machine to go there! After lunch we continued along quiet roads, paths and a short stretch of towpath. Lest anyone is wondering, there were a number of signs relating to Foot and Mouth, but the only one affecting a path we used was to state quite explicitly that the path was open. All the roads we used were carrying normal traffic, and there were plenty of walkers, many with dogs running free, on the paths. This was supposed to be a group photograph, opposite a reputedly haunted mill, but Peter King had ridden off into the distance, along a road which did not form part of the ride, so he is missing from the picture! Note to Graham - we really needed the XPan camera for this one. Bridges can provide photo opportunities. If I had a Speed, I wouldn't do this with it, even for a photograph. 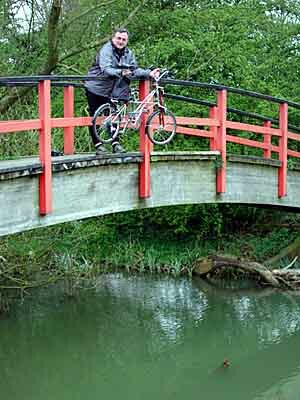 Don't worry, Shaun, Graham didn't actually drop the bike! We got back to the station at about 4:00pm, which allowed time for those who had travelled from further afield to get back home in daylight. The distance was measured as about 35km, although I had done 57km by the time I finally got home. All the bikes performed faultlessly. Graham seems particularly enchanted with his new Speed - despite what the rather alarming photograph above might suggest. 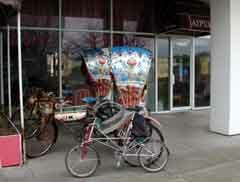 Right: Graham does not like curry, but nevertheless we persuaded the Speed to pose with some trishaws near the station. 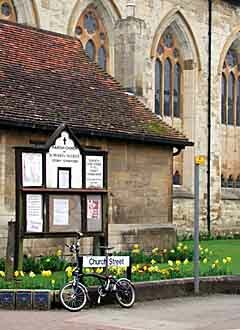 For the record, both the Moultons and the standard Brompton arrived by train, two locals rode to the start, and the rest came by motor vehicle. Graham and Peter came from London on a Silverlink train, so had no problems with the Moultons. 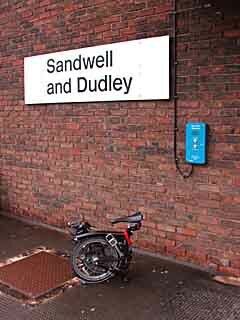 Although I found the Brompton more than adequate for a short and very leisurely ride like this, I think I might opt for using Silverlink from Birmingham another time - it takes longer, but it does leave the choice of cycle more open.